Have you explored the culinary scene in Harlem? I remember when I moved to NYC twenty years ago Harlem was nothing. But in the last 5+ years it's been booming and has transformed into a really hip neighborhood, with great restaurants and a unique vibe of it's own. 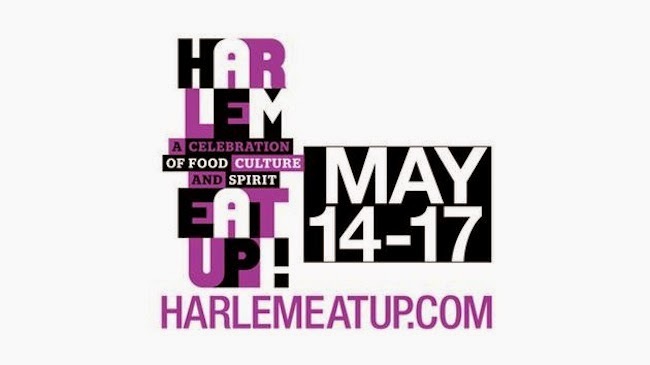 Yesterday kicked off their first annual Harlem EatUp! festival. I'm a little late in catching on to this buzz, which is unfortunate, because most of the tickets for the private dining at the individual restaurants that are serving up a set tasting menu are already sold out. The two words I hate to hear! BOO. However, a Sunday Afternoon in Harlem, eats package which provides 10 food tickets is still available. Here's a list of all the participating vendors. Who doesn't want some awesome soul food, fried chicken, and ribs? DROOL. I've ate at a few of these restaurants like Red Rooster, Dinosaur Bar-B-Que and Sylvia's in the past and all three lived up to the hype. It's definitely good home cooking and worth hiking it up town to indulge. If Harlem EatUp! is set up like how other food fests are that I've been to elsewhere, I assume these vendors will have individual booths set up and you can pick and choose where you want to use your 10 tickets to taste a bite of each booth. It's a great way to have a taste of Harlem. Then you can narrow in on which booths you enjoyed most and make a date to have a proper meal at that restaurant in the future. It's a win, win guys so head over and support Harlem! I can't wait to pig out on Sunday! See you there? Buy your tickets here before it gets sold out. It's only ON this weekend. The festival is on Sunday, May 17, 2015 from 12 - 4 pm. EAT. EAT. EAT!! !